Last Saturday, on the very first snowy day in New York, we organized a 14-hour hackathon we named the Battle of the Sensors. After a successful edition in Amsterdam in May, we decided to challenge the hackers of the Big Apple right before TNW New York on Tuesday. 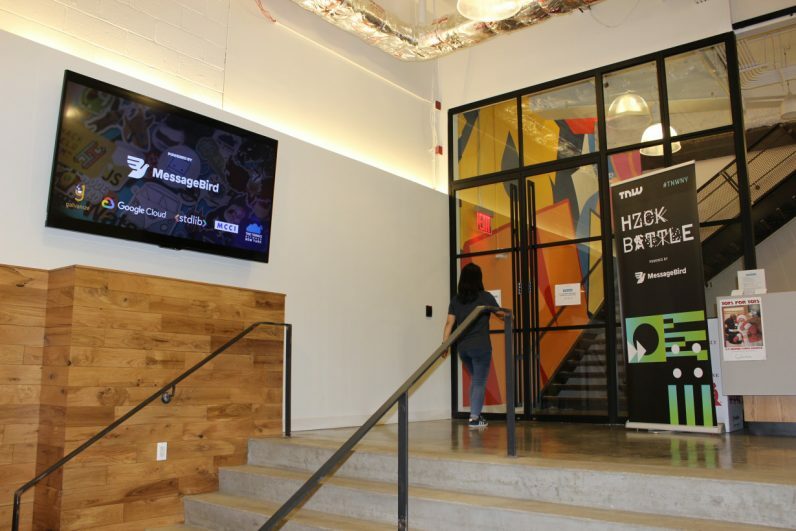 We were proud to count our friends at MessageBird as hack battle co-hosts – alongside partner APIs Google Cloud, StdLib, The Things Network New York and MCCI. Without further due, here are this year’s top ten hacks. In Kathmandu, the capital of Nepal, the water supply is regulated by a government owned central supplier. There is no schedule for when water is supplied to neighbourhoods, so people have to constantly monitor when they have water. H2Flow uses the data they collected to get a better understanding of the water distribution problem. A sensor detects if water is flowing and with the MessageBird API, send out an alert if it is. As soon as the water runs out, the user receives another alert. As the overall winner, H2Flow won Lego Mindstorm. Danger is an app that would have been perfect for the Amsterdam hack battle; it creates danger-free cycle rides. Danger was the Google Cloud Winner for use of Google API’s and won Google Home. The Borough Board helps citizens to stay updated about the improvements in their neighbourhood. The hackers created a Trello-like board with different complain types that they aggravated from open source data about neighbourhoods. Citizens can then go in and will see what problems will be taken care of in the neighbourhood. Thanks to Firebase users can see exactly which governmental agency is responsible for taking care of the problems listed. They can also subscribe to complaints and be updated via sms. As the overall Google Cloud winer, The Borough Board won Google Home and Google Cardboard. Chug or Not uses Twitch TV to give beverage sponsors a more fun and engaging way to share their message. A sensor pad monitors the streamers’ liquids consumption and gives the viewer a chance to vote for them to “chug” their drink directly on the Twitch TV stream. According to the weight that is placed back on the sensor, the application checks if they have really chugged their beer. As the StdLib winner, Chug or Not won 4 Nintendo Switch’s. Life in New York City is busy and thus noisy. ‘The Viberphone” monitors sound data of buildings and shares that data through Google Cloud Platform, via Firebase through the MessageBird API, to the user. The user can then directly inform the super or owner of the building via sms or voice call. When you are in trouble, you probably have time for a maximum of one phone call. KEU is an app that allows you to send an emergency call and message (including location) to multiple numbers, just by pushing one button on the app dashboard. All you need to do is sign up with your email and name and provide the phone number of your emergency contact, as well as the message you want them to receive. All data of registered people is saved in Firebase. Fomo the pig shows you exactly how much fear of missing out you should have in terms of investing in cryptocurrency. Every time you drop a quarter in the pig, it sends you a message with your current balance and what that balance would be in bitcoin. The app uses Google Cloud Platform to store the data and then asks the standard library to check the current bitcoin rate. After that, users receive a message via MessageBird. Many people keep old phones in drawers after they switch plans, so why not use them to mine cryptocurrency? iPhoneCoins is an app that lets users mine cryptocurrency after they connect their Coinhive account. Based on the current rate, users could make 30 dollars a year. However, they would probably have to put their phone on ice if they don’t want to burn a hole in their table. Earn money while reducing your carbon footprint. This app can measure temperature, water, and electricity usage in their users’ home. When neighbours all use it, they can create a competition between who uses the least electricity and therefor has the lowest electricity bill. Sofas integrated a standard library to create a stripe store where users can invest in more energy saving measures.